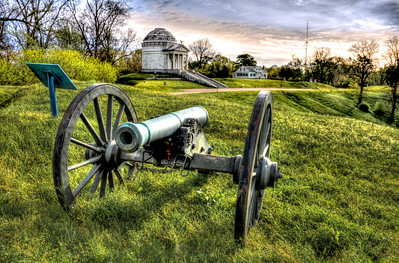 For Union General Ulysses S. Grant, Vicksburg had been his obsession for nearly a year. His military - and ultimately, his political - career would hinge on whether he could take the city. 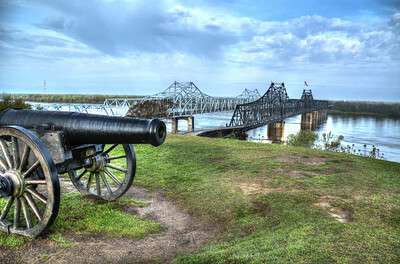 Twice Grant tried to storm the bluffs of Vicksburg. Twice the rebels repelled him. 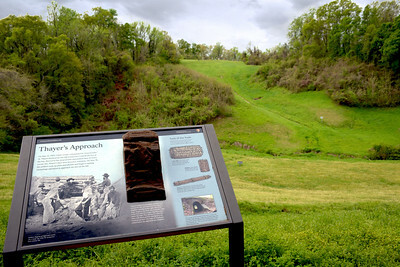 One example of the challenge facing Grant's troops - On May 22, 1863, Union troops commanded by General John Thayer were ordered to storm this hill toward a Confederate earthen fort at the top. A few soldiers came with a few yards of the top, but ultimately the charge failed. 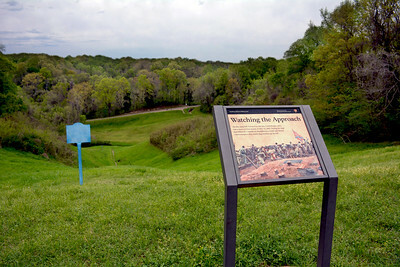 On May 30, the Union soldiers began digging trenches up the hillside, hoping to get enough men and explosives in position to overcome the fort. But that operation was also unsuccessful. 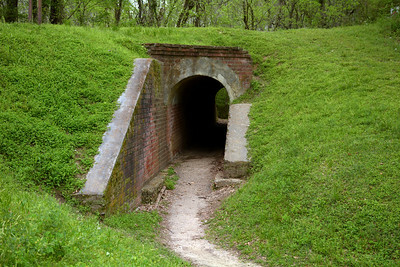 To prevent Thayer's men from exposure to Confederate fire, a short tunnel was excavated through the ridgeline protecting the Union forces. Once the Federals broke through the ridge, under cover of darkness, they were able to begin digging the approach trench toward the Southern position. 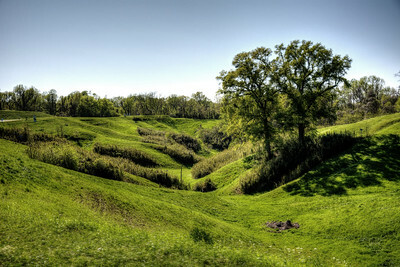 This would have been the scene from the Confederate fort - Thayer's troops attacking up this hillside. The blue marker shows how close some of the Union troops got to penetrating the Confederate defenses. 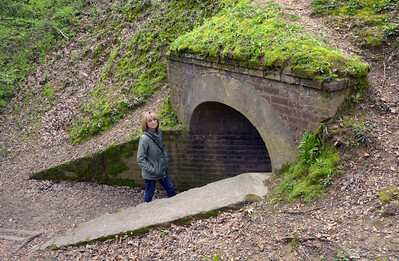 Another example - Union General William Tecumseh Sherman asked for volunteers - 150 in all, all unmarried - to charge up this section of the battlefield and bridge a 7-foot deep ditch fronting a Confederate fort 200 yards ahead. The volunteers called themselves "The Forlorn Hope" - for good reason, since only a handful would make it to the ditch alive. Sherman ordered a second advance, and again the Federals were ripped apart. At that point, Sherman shouted "This is murder. Bring those troops back!" The survivors were awarded the Medal of Honor. 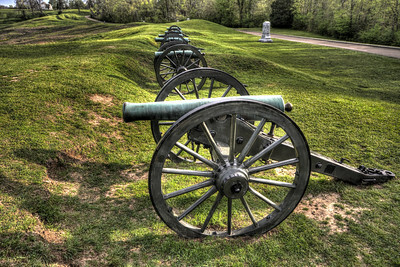 So Grant ordered Union troops to barricade the city and begin lobbing shells into the town from 172 cannons like these that encircled the city for 14 miles, firing day and night...for 47 days! 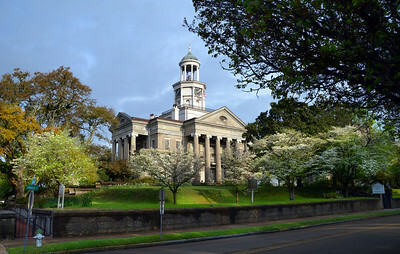 The Old Courthouse, built in 1860, seemed like an inviting target for the Union bombardment. And indeed, the Union artillerymen often took dead aim at it. But it was hit only once, and generally survived intact. Confederate General, John C. Pemberton, a northerner by birth, feared public condemnation if he surrendered the city, but he had no choice. 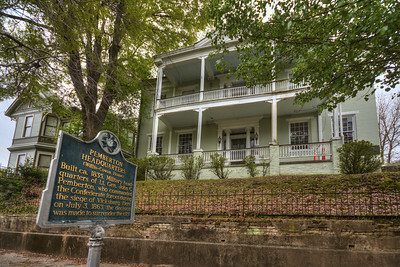 It was in this house that he made the fateful decision to turn over the city to Union forces. General Pemberton rode out to this spot to meet face-to-face with General Grant. And he chose a conspicuous day to hand over the city to the Union Army...the 4th of July, 1863. 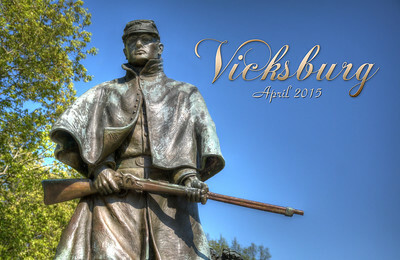 The citizens of Vicksburg would not celebrate Independence Day for the next 81 years. To the victor goes the spoils...or in this case, the high ground. 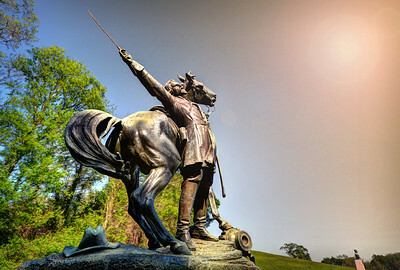 The statue of General Grant stands atop the highest point along the Union lines. 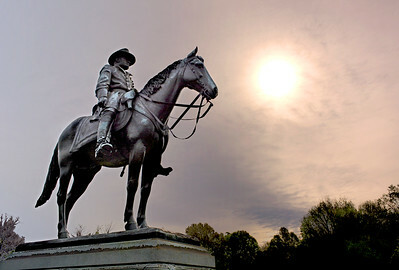 In contrast to Grant's heroic pose atop his horse, the statue of General John C. Pemberton - the Confederate general who surrendered Vicksburg - is much less grandiose. 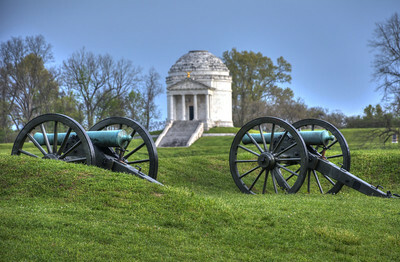 The battlefield surrounding Vicksburg was established as a national military park in 1899. In the park there are some over 1330 monuments, markers, tablets, and plaques. 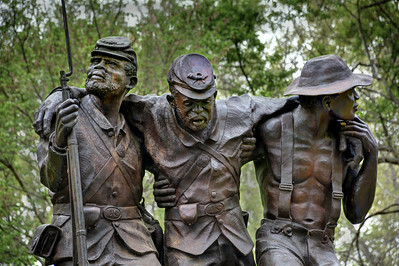 Many monuments depict soldiers cast in the dramatic poses of battle. 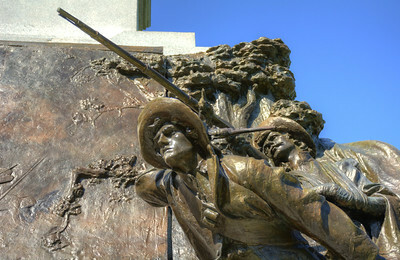 This bronze work is part of the Mississippi State Memorial. 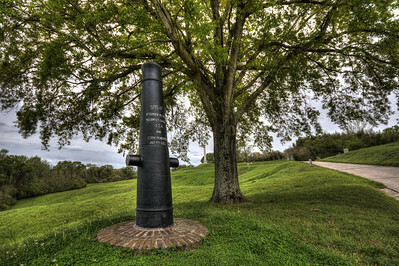 The Memorial in Memory of the U.S. Colored Troops honors the troops who first came under fire guarding Grant's supply depot across the river in Louisiana. 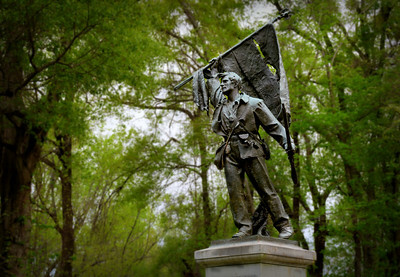 This bronze infantryman holding a rifle in one hand and the flag in the other honors the 7th Rhode Island Infantry, the lone regiment from that state in the Vicksburg Campaign. It was dedicated in 1908. 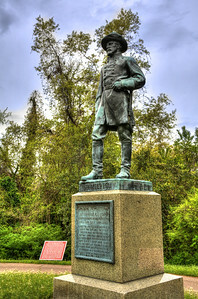 ....Confederate General Lloyd Tilghman was killed attempting to thwart the Union advance at the Battle of Champion Hill, about 20 miles east of Vicksburg. 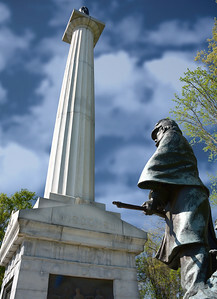 The site of the battle is on private property, so relatives of the General persuaded the government to site his memorial in the Vicksburg National Military Park. 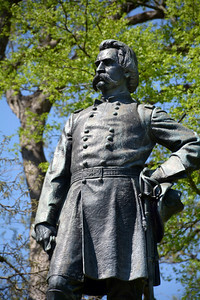 This distinguished, mustachioed gentleman is Union General John A. Logan. 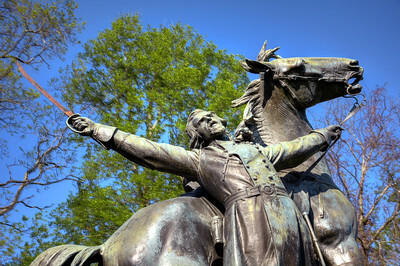 Logan's troops were among the first to enter the city of Vicksburg in 1863, and after the city's capture, Logan served as its military governor. 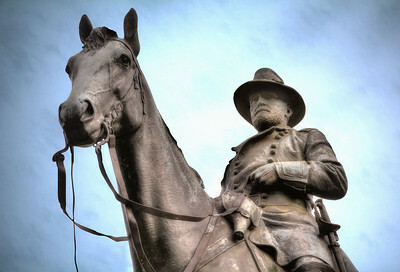 His likeness also appears on a statue at the center of Logan Circle, Washington, D.C., and in Grant Park in Chicago, Illinois. And no military park would be complete without cannons. 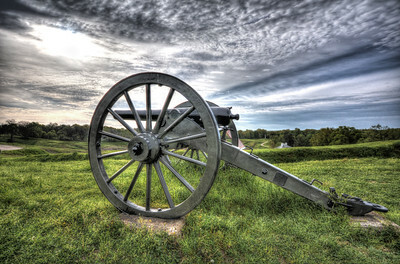 And there are plenty of cannons positioned around the battlefield, most in places where they actually were during the battle and siege. 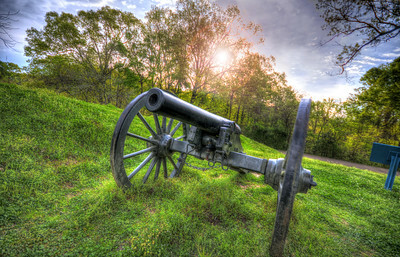 This cannon stands in front of the Illinois Monument. 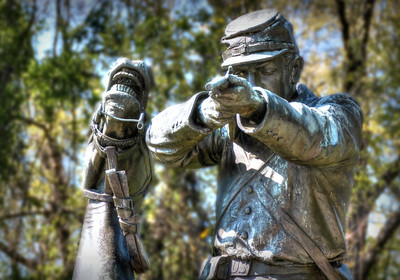 Nearly half of Grant's army – more than 36,000 troops – came from Illinois. And Illinois was also the birthplace of General U.S. Grant. 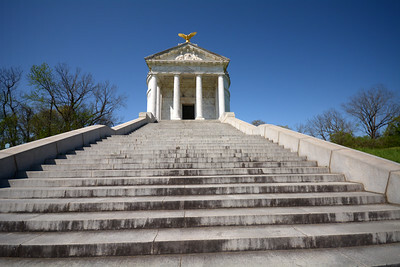 There are 47 steps leading to the Illinois Monument – one for each day of the Vicksburg siege. 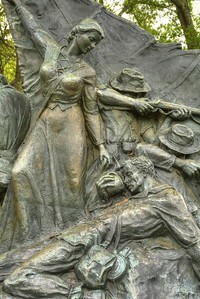 On the Alabama Memorial, the state is represented by a woman who gives aid to a wounded infantryman.